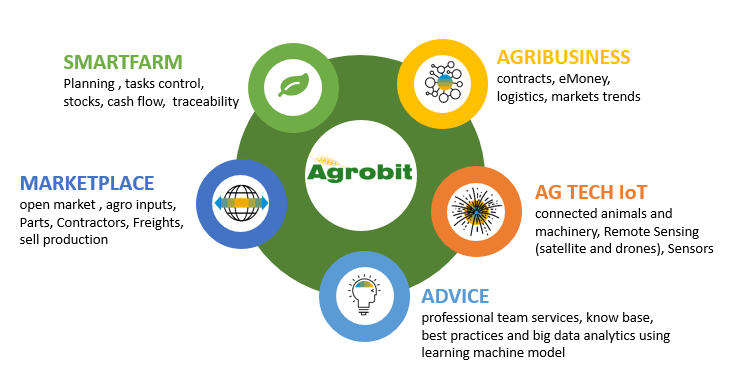 Agrobit Smartfarm is innovation. Agriculture management, logistics and agribusiness with predictive analytics, food traceability & internet of things. Automatic and easy to use with Smart Farm, increase production, improve food safety with food traceability, protect the environment and save costs and time, optimizing the use of resources. The easiest way to manage your farm everyday, with predictive capability, alerts, devices and machines connected to monitor all activities in real time. Keep your farm business RUN EASY with real time information. For cooperatives, enterprises and governments. Identifying and tracing the production processes during all stages and following standards in certification of origin and product quality. Planning and budgeting are dynamic processes that affect work flow and production. They can be used as budgeting control, work order generation guide, contract planning, supply needs and more. It also accepts manufacturing estimates allowing manual or automatic update as variations may occur. A complete work circuit assigning a job to own staff or contract personnel and connecting the real event to the assigned work order can be accomplished. Management and control workflow to speed up internal processes. Management and control of vehicle traffic, containers, drivers, origin and destination, weight, trip control, etc. complying with all requirements. Keep your task and information in your Mobile APP. Real-time indicators and alerts. Real-time management dashboards sorted by farms, activities and fields. Flexible web report generator, email alerts and mobile user’s ubiquity. Preconfigured templates to speed up functional processes to load data. Use IoT technology to connect things with people and processes, and take advantage of the Industrial IoT and Internet of Everything (IoE). Real time information from different devices, analytics across your business and big data. By registering quality protocols Agrobit fulfills international requirements. Knowledge base, best practices and historic production data to help decision planning and budgeting. Maps, devices and tasks Integration IoT to the machines. Know the location, fuel consumption, travel, tasks performed and routes traveled by the machines in real time. Traceability management to identifying and tracing the production processes during all stages and following standards for quality assurance. Real time alerts to control pests or disease and to make predictive analysis. Real-Time market prices local & international. Real time weather information. Predicting weather patterns for the next weeks. Real-Time Logistic control, vehicle traffic, containers, drivers, origin and destination. Real time status and historical reporting to control and to make predictive analysis.